Brown the mince in a hot frying pan, breaking the meat up as it browns. Add the pasta sauce to the mince. Use the beef stock to rinse out the pasta sauce residue in the jar before adding to the mince. Bring to the boil. Reduce the heat and simmer for 10 minutes. Place three lasagne sheets on the bottom of a greased 18 x 26 centimetre ovenproof dish. Top with half the meat mixture then one third of the Béchamel Sauce. Place another three lasagne sheets over the sauce and repeat layering with meat and sauce. Top with another three lasagne sheets. Spread over the remaining Béchamel Sauce. Top with cheese. Bake at 180 degrees C for 30 minutes. Remove from the oven and stand for 10 minutes before serving. Pour the milk into a saucepan. Cut the onion in half and peel. Add to the milk with the bay leaves and peppercorns. Bring to the boil. Remove from the heat and leave for 15 minutes for the flavours to infuse. Melt the butter in a saucepan. Mix in the flour and cook until frothy. Remove from the heat. Strain the milk into the butter mixture. Return to the heat and whisk until the mixture boils and thickens. 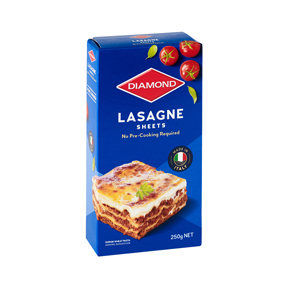 For Gluten free product, use Diamond Gluten free lasagne sheets and use a gluten free flour instead of the regular flour for the Béchamel Sauce. 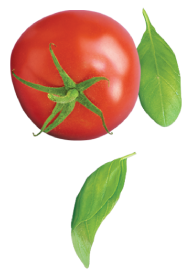 For Gluten Free and Dairy Free, use a non-dairy milk, a dairy free spread and gluten free flour to make the Béchamel Sauce and gluten and dairy free breadcrumbs to replace the cheese.